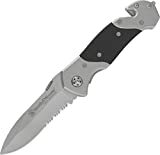 The Smith & Wesson SWFRS First Response Knife is an emergency knife designed for those situations that you hate to think about but have to consider like a car accident or natural disaster. Smith and Wesson has put together a solid knife that is inexpensive enough to dedicate to your car or truck and nice enough to carry every day. First of all, the knife has a drop point, combo edge blade. Typically, I’m not crazy about combo edges, but for an emergency knife where you would potentially be sawing through clothing, rope or a seat belt, a partially serrated blade can be a good choice. The blade measures 3.3″ and is made of 440C high carbon stainless steel, a tough steel that holds it’s edge well. In addition to the primary blade, a seat belt cutter is sunk into the back part of the handle. This cutter is great for cutting seat belts, but also an serve to cut cord and other fibrous material. In addition to the seat-belt cutter, a glass breaker has been molded into the pommel of the knife. If you were to get into an automobile and your vehicle went into a body of water, it could be difficult, if not impossible to open the doors or windows. That’s where a glass punch like this is essential. It concentrates the entire force of a swing into one tiny point, creating the impact necessary to shatter the tough glass used in modern vehicles. The handle is a combination of stainless steel and G10 scales to provide a tough and slip resistant grip on the knife. The handle is large and comfortable and the blade rests securely in the hand. The handle compliments the large and heavy blade that you can easily deploy with a flick of the wrist. The primary mode of deployment is a large thumb disk on the top of the blade. This makes the knife easy to open in a variety of conditions, even when you are wearing gloves. When open, the knife locks up tight with a sturdy liner lock. This is a solid chunk of steel and I was impressed by the weight and balance of this inexpensive blade. The SWFRS is an inexpensive rescue knife that could be a good option for someone looking for an inexpensive beater knife with rescue knife features. At well under $20, this is not the most finely crafted piece of cutlery on the market, but it is bound to appeal to certain buyers and represents decent value for money. Potential buyers may be disappointed to learn that the SWFRS is not actually made by Smith and Wesson, but is made using the Smith and Wesson brand in China. Still, they say price cures all problems and for around $15 you get a reasonably solid folding knife that you can beat on without feeling guilty. If you are interested in purchasing the S&W SWFRS I recommend buying it at Amazon.com. Buying the knife through either of these links earns me a small commission and helps support the site. Well good review blade steel is not 440c it is c17nov witch is a much better steel and the knife is made in china. The seatbelt cutter and glass breaker are useless. S&W third gen first response tool is much more suited than this one is for the job.